I was early on this beautiful scene of Pont de Bir Hakeim for a sunrise wedding anniversary photoshoot. As I walked on the meeting point, I felt the thundering metro train passing above the bridge. I also passed by a couple whom were immaculately dressed, exuding warmth and friendly energies. They too were enjoying the view of the rising sun behind the magnificent Eiffel Tower, casting a tall shadow over the River Seine. I secretly wished in my heart that they would be my clients for that mornings photoshoot. Turned out that this couple were my clients after all! My heart cartwheeled with glee! They had booked this sunrise Paris photo session to commemorate their 10th wedding anniversary. The day before this photoshoot, they had renewed their vows and exchanged rings in the oldest church in Paris, called Église de Saint Germain de Prés. Scroll further down to see Adriana's fabulous new ring exchanged to her in their sacred ceremony. Miguel and Adriana was already game for their Paris photo session during the test shots for the light. I knew immediately that we were going to have an awesome photoshoot. I could just tell by the way the held each other, the way they sat against each other, always touching even for the test shot! The first portrait of them above is only a test shot for the lighting and they're already loved up. See what I mean?! Their body language was not only a language of love, but of togetherness, being present with each other in the moment. Oh! 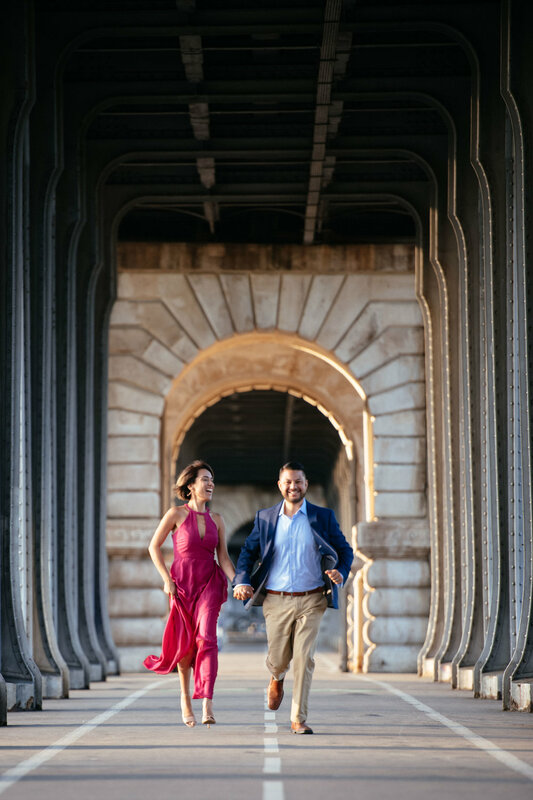 Absolutely my kind of couple who gets me all fired up and reminds me of why I'm passionate about being a Paris photographer! Because they were 100% in love, 100% committed to each other and 100% being in the moment with each other despite of me, with my camera clicking away at them. I'm their Paris photographer after all! The results of their photoshoot in Paris is just stunning and soulful! Miguel and Adriana needed very little guidance when it came to posing for their Paris photoshoot. I only had to place them at the different spots around Pont de Bir Hakeim and tell them to either stand, sit or run. They fell into their poses naturally. They twirled and danced. Kissed and embraced. Smiled and laughed. Their Paris photo session was so much fun and memorable. I was often quite a distance away from them. All I did was photographing them enjoying themselves, being who they are as an individual and to each other. Such a loving and energetic connection. A huge thanks to mother nature too for that glorious soft morning light beaming through the clouds when the sun rose. The highlights and shadows gave mood, depth and dimension to Miguel and Adriana's wedding anniversary portraits. Tangible memories without an expiry date. Only to look back and cherish. Our photo session was at 6am, which was a bit of a struggle to wake up, but well worth it. The final product of our photos was outstanding no people in the background and the lighting was great. I highly recommend Shantha for any special moments you want to make last forever! Thank you again Shantha we had so much fun and our pictures turned out perfect! I wish Miguel and Adriana continued marital bliss, great health and a prosperous life together. 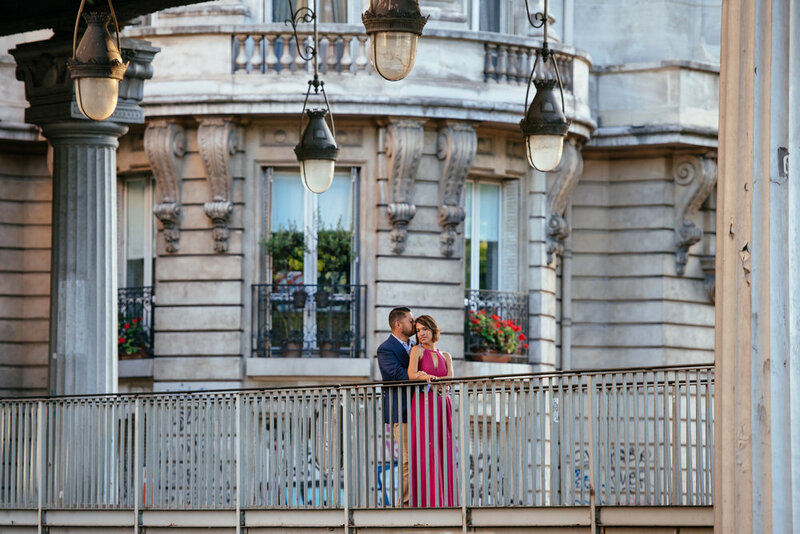 I hope you have enjoyed reading and looking through Miguel and Adriana's wedding anniversary photoshoot in Paris. You could have a similar experience to hold your precious memories of your time in Paris with your beloved too. Just click on the button below to connect!